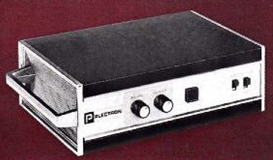 Plectron desktop and mobile receivers have been around since the late 1950s. The Motorola MINITOR pocket pager was available later in the same format. The use of these receivers is still widespread, especially among volunteer firemen and first responders. But with the exception of dispatch consoles, standalone Plectron encoders have become very hard to find. The 7330 already knew how to generate beeps, CW characters, common tone pages (single tone, two-tone sequential, five tone, and DTMF), and speech. But it did not have Plectron tone codes, so we added them in Release 1.8. That, plus the 7330’s ability to add attention-getting signals to the page, made it the right choice for the job. There are 59 Plectron tones ranging from 282.2 Hz to 3487 Hz and three timing formats. One format involves sending tone “A” for 750 ms, then tone “B” for 250 ms.
Let’s create a two-tone sequential page and place it into macro 1234 (with 340 macros, there’s plenty of room for all of your paging codes!). We’re done. Macro 1234 will send 800 ms of 435.3 Hz followed by 300 ms of 1232 Hz. If desired, we can embed attention-getting single-tone beeps, dual-tone beeps, CW, DTMF, or prerecorded speech after the page portion of the message. There are additional codes available that insert delays and adjust audio levels. Note that tone pages are always sent non-mixed and non-interruptible, so in this case we can ignore those topics. To send the tone page, we can enter 1234* in DTMF via any port. We can wire a switch to a logic input to make sending a page as simple as pushing a button. And we can automatically test the system at selected times and dates by using the scheduler. For further information, see Two-Tone Sequential Page Messages in Chapter 6 and the Plectron Tone Code Table in Appendix A. The approach described here is not limited to Plectron paging and can be used with any of the supported tone page formats.